I suppose if I were 30 years younger I, too, would be swooning over the Jonas Brothers. They seem to have become a teen/tween phenomenon like nothing since... oh, I don't know... Hannah Montana? 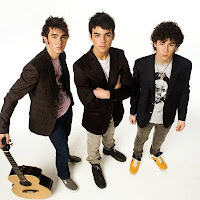 My kiddos haven't yet hit the Jonas Brothers stage, they prefer High School Musical and Hannah Montana - but I'm sure it's just a matter of time before one of them has a poster of Kevin, Joe and Nick on their bedroom wall. It also seems fitting that Bruce Hendricks, the director of Hannah Montana/Miley Cyrus: Best of Both Worlds Concert Tour, has teamed up with the teen trio on their very own 3D concert experience.